I'm sure you do. Beware of boredom and internetaccess at the same time; I'm actually glad I lost a few of the auctions I was active in today! deadlyhandsome, Tukwila and Steve1857 like this. deadlyhandsome and steur like this. Modern Barbisio Homburg. There is no paper label under the the sweat. 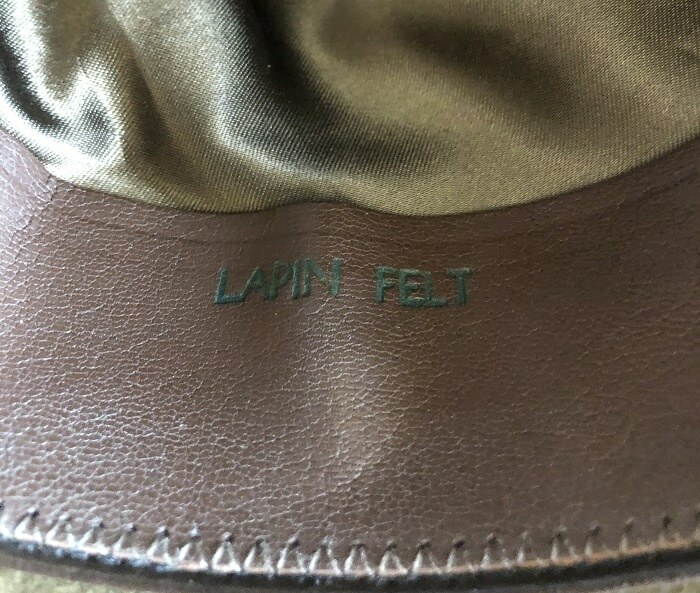 I had to ask Mr. GooGoo what Lapin Felt was! This rabbit has a real nice soft feel. I like this one! belfastboy, mayserwegener, Tukwila and 4 others like this. Is that a Poshmark hat? It looks like one I made an offer on but the seller and I couldn’t agree on a price. Looking at your photos I regret not buying it. Well done! oh, Sven Homburg by Hufvud. Rmccamey, mayserwegener, Tukwila and 4 others like this. Good get, Rich. Barbisio is a top maker. Even their modern ones were very good hats. Steve1857 and quikrick like this. They're getting better and better, Mikael. The first one even has some reverse taper. This is my favorite for colors combination and the shape is really interesting. Thank you kindly! Its been a great inspiration to make ever since I saw a photo of my late grandfather wearing one in the 30s. steur and Daniele Tanto like this. A mystery Czech purchase that remains a mystery. 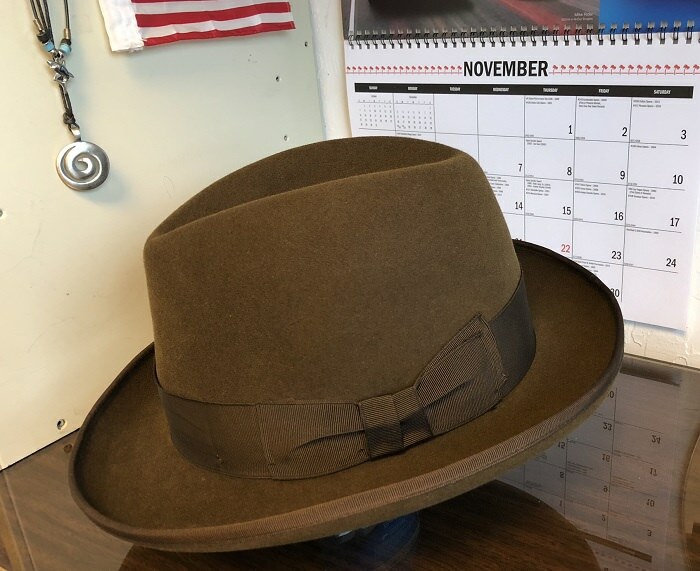 It has an overwelt brim sans binding so not technically a homburg, but it doesn’t “feel” like a lords hat either. The velour is soft, but the felt has a stiff core somewhere between a western and dress hat. Fits true to size and after some brushing, steam, and 30 minutes on a block to make it more of a long oval, it feels great. steur, mayserwegener, belfastboy and 5 others like this. It looks great too, despite its mystery. I can almost feel the softness of the velour. A post 1993 Czech hat, obviously. Possibly this century. Strange there's no maker's mark apart from the Tonak/Czech type crest. 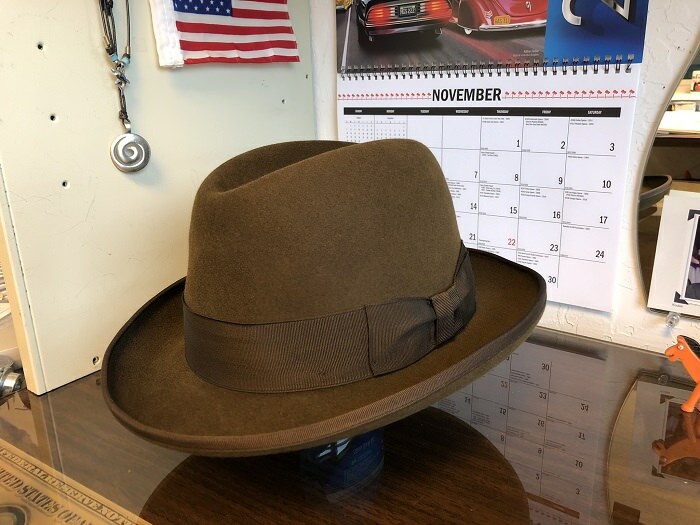 I'd steam it some more and curl the brim to give it a more classic Homburg look, but that's just me. Looks good on you, Deadly. The piping on the liner is also Tonak like. I am not aware of any other company in the Czech Republic. deadlyhandsome and Steve1857 like this. Very nice, Brent. It may not be a full on homburg, but it is a really cool hat whatever you might call it. I have posted this one a few times in the WHAYWT thread, but not yet a full pictorial of the hat. Here goes. The Duke hat lords hat in grey. Brim at 5cm and crown 10,5cm at the pinch. This may have some wool content in the mix even though the sweatband says "pure fur". English made hat and judging by its liner, size label and sweatband an early one. No label behind the sweatband, so hard to say who the maker was. First lords hat in grey I've seen so far. Steve1857, EinarsM, Tukwila and 1 other person like this. Barbisio lobbia in the colour Umbria. Qualitá extra extra. This one was NOS, but had me confused. Like a kid lying about their age to get a drink, this one lied about its size. First I thought it had shrunk and I did put it on the rack. Not to make it confess (it didn't expect the inquisition), but to get it to the size it told me it was. 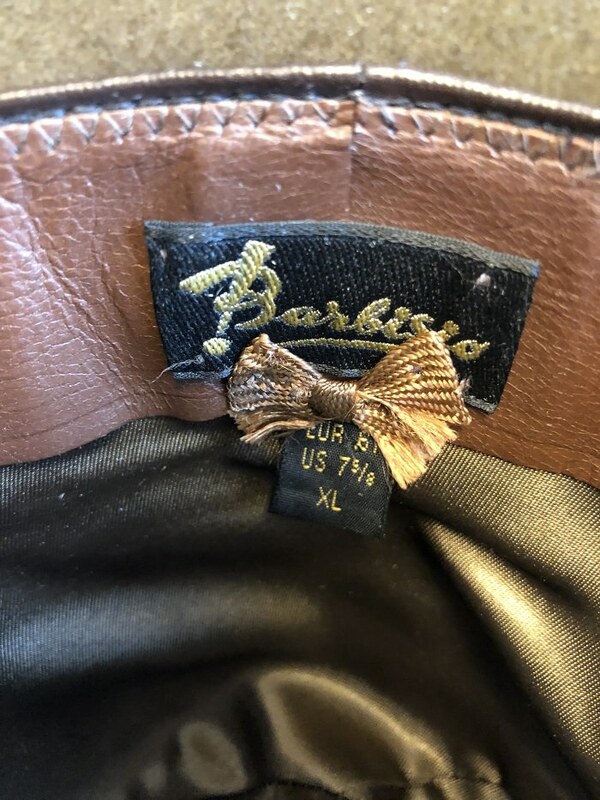 Hatters are human too: the size label on he sweat is one size up (56) from the one that was hidden underneath the liner (55). It fits me now, albeit that the backseam of the sweat shows a small gap. The brim is beautifully curved and sits at 5cm and the crown reaches 10,5cm at the pinch. Fairly stiff for an Italian made lobbia. It could pass for a bowler if creased open crown. Steve1857 and Tukwila like this. Borsalino lobbia in grey. As this one doesn't have a label inside I compared it to my other Borsalinos. It is the Argento colour. Brim sits at 5cm and crown 10cm at the pinch. I have another one of these one size smaller (this one is a size 57), but this one is much more comfortable. Qualitá extra superiore. I think this one is from the seventies. 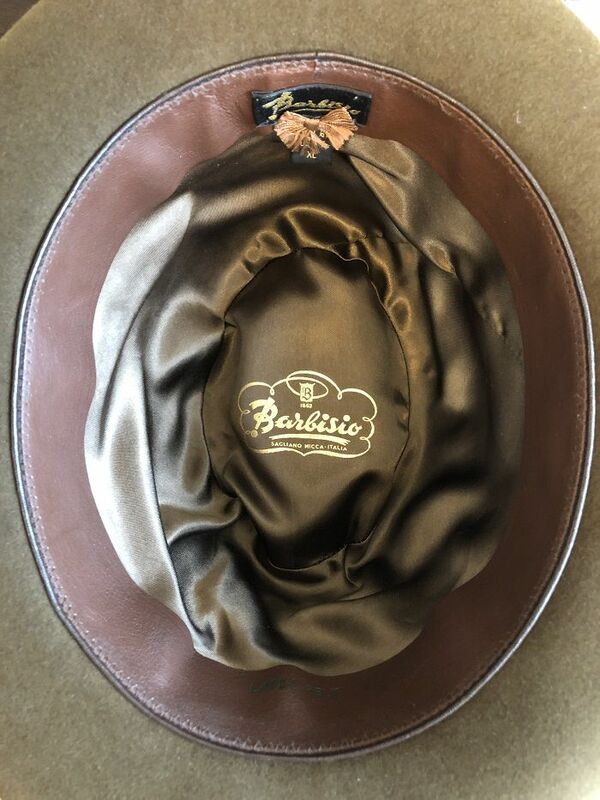 Borsalino Lobbia in brown. The label inside the hat gives no information and comparing the colour didn't give an exact match. It's a bit lighter than the Caffe and somewhat less saturated than the Folco, but it's closest to these. Let's just call it Marrone. I'm fairly certain it's a Gulaela model, with the brim at a good 5,5cm and the crown at 11cm at the pinch. Qualitá extra superiore. It doesn't like the pinches and only takes the shallowest of these. The sweatband has some texturing, which is seen more often on earlier models.